and I know it’s not a good parenting technique to have favourites but Iris! some other flowers to share the space and derive great pleasure from them all but --- I still anticipate the month of June for the spectacular colours, fragrance, and textures of my tall bearded Iris. In Mythology she was the Goddess of the Rainbow and she certainly brings that rainbow to the garden. Botanically these flowers have 6 petals, 3 falls that typically curve out and down and 3 standards that curve up and in. They grow from bulbs or rhizomes, (big fat underground stems,) in temperate climates. What a boring description for a flower that graces my garden from early spring to mid summer. Hopefully the picture on the right is a better illustration. The small bulbous types, about 3" / 7cm tall appear just after the snowdrops in yellow Iris danfordiae and a variety of blues such as I. reticulata, on the left. They are followed by a succession of ever larger rhizomatous varieties through about 6 categories (that only specialists care about,) each group blooming a little later, throughout May, and showing increasingly bigger blooms culminating with the tall bearded beauties in mid June. 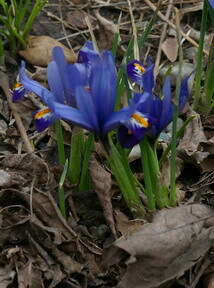 In early May, the miniature dwarf bearded burst into bloom from a dense carpet of short leaves and reach 8" / 20cm tall. They have a wide variety of colours and make great ground cover or rock garden plants. The mid season ones such as Ruby Eruption, pictured right, can form large clumps in few years and have bloom stalks that are up to 15" / 38cm tall. 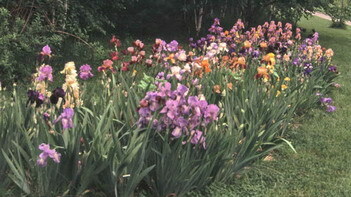 The tall bearded Iris grow over 27" / 70 cm tall from clumps that can be 10" - 20" in diameter. 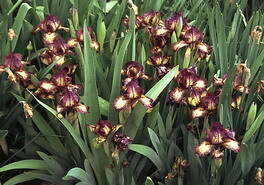 A large clump will have several bloom stalks each of which may carry up to 6 blooms. The blooms themselves can be 6" / 15cm and the petals display a wide variety of wrinkles, frills and shapes. The colour range is quite extensive and is really only missing a true red. When you can have something as wonderful as “Silverado”, above, in your garden it seems to be worth the effort. These clumps need to be dug up and divided every 3 - 5 years to keep a strong flowering group. This is conveniently done in late July / early August when the list of other gardening chores is fairly short. The big advantage is all of the extra pieces of rhizome that you can give away to friends and neighbours. One of the real joys of gardening. There is also a nasty bug called the “Iris Borer” that can be a problem in some geographic areas. Learning its life cycle makes controlling it manually, a bothersome but not overly difficult exercise. They can also be controlled with parasitic Nematodes. Most garden centres and mail order catalogues carry several varieties. Plant a few and then you get hooked and want more and better. 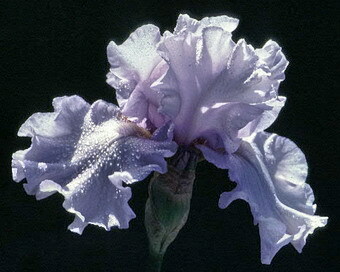 There are, of course several specialist Iris breeders and nurseries and they are best accessed on line. As they are shipped as plant parts, getting them across borders can be difficult. Here are a couple of specialists that I am familiar with. 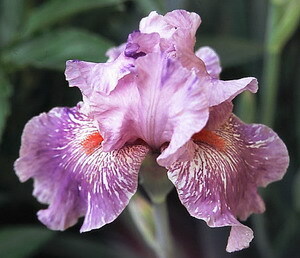 In the U.S. one of the biggest is Schreiner's Gardens and in Canada, I have frequently purchased them from Chuck Chapman Iris. There certainly are other sources available and you will be astounded at the number of varieties you can choose from. The thrill of Iris in bloom will always guarantee them a place of distinction in my garden. I may someday have to choose from the over 100 varieties I currently grow and that will be the hardest work of all.